This weekend I am taking a 3 day class. It's from 8 - 5 and just hard to sit here and absorb that much so to make it a little more fun, I have also declared it CUPCAKE WEEK!!!! It's a very big deal. I will be trying 7 new cupcake recipes and bringing them to my class to make life a little better. Today is SODA cupcake day #1. We all love our caffeine so why not put it in cake? After a little research, I came up with some ideas for Mt. 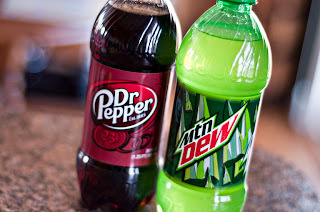 Dew cupcakes and cherry Dr. Pepper cupcakes! Preheat oven to 350. Line 2 muffin cups with liners. Combine cake mix and Mountain Dew in the bowl of an electric mixer and mix on low speed for 30 seconds. Scrape the sides of the bowl and beat on medium for 2 minutes. Put directly in pans. The soda will make the batter foam up and if you lose all that, it will make the cake flatter. Fill cups 2/3 full and bake about 15 minutes or until tops spring back when lightly touched. Remove pans from oven and poke holes in warm cupcakes with toothpicks. Brush lightly with Mountain Dew. Turns out I don't have a brush, so I used a tiny spoon. Remove cupcakes from pan and allow to cool on rack. In the bowl of an electric mixer, the combine softened butter, Mountain Dew, and extracts. (I just used about 1/2 tsp of lemon juice and the vanilla.) Beat on medium low speed until well blended. Add powdered sugar and beat on low speed until combined. Increase speed to medium high and beat for about 2 minutes. If frosting is not thick enough, add powdered sugar until you reach desired consistency. I ended up using a 2 pound bag, which is 8 cups. Using gel food coloring, color half the frosting yellow and half green. Place in a piping bag side by side and pipe onto cooled cupcakes. I should have taken picts of putting the frosting in, but just split it as best you can and squeeze until both colors come out. Top with yellow sprinkles. I think these look adorable. It doesn't really taste like you are eating Mt. Dew or anything, but it was very moist so that's good right??? Upon approaching the Mountain Dew cupcake I was attracted to the yellow and green swirled frosting that sent me dreaming of a lemon lime twist ice cream cone. The first bite of the cupcake was slightly disappointing as it did not taste much at all like the nectar of the gods that is Mountain Dew. Upon further assay of this extremely moist yellow cake I encountered the delicious hint of citrus flavor. The soft luscious creamy frosting added a delightful touch of citrus goodness. Overall I give this cupcake a 4 per out of 5 only marked down slightly for false advertising.